Ever questioned why buying organic cotton sheets is justifiable? The below comparison will hopefully give you some food for thought as you consider your next purchase of sheets - for yourself or your children. An organic certification will normally cover every aspect of the growing, harvesting, cleaning, dyeing, printing and finishing processes which go into making your organic sheets. Planting – cotton is grown using GM seeds to ensure higher yield. Soil - cotton fields need to be pesticide and fertiliser free for a period of 3 years before they can be certified organic. No GM seeds– untreated seeds welcome beneficial insects and companion planting is introduced and the crops are manually tilled. Growing – cotton is very prone to disease and pests like aphids, lygus bug, thrips, army worm, cut worm, spider mite, boll weevil, spider mite. Pesticides are also used to produce a higher yield – in fact cotton is one of the most heavily laden crops (with poisons). This is harmful to workers and the environment. Harvesting - organic cotton is hand-picked using natural defoliation methods either by freezing temperatures or water management. This method works in harmony with the natural environment. Whitening- safe bleaches are used and low impact/azo free dyes or natural dyes are used for dyeing the fabrics. Washing- organic cotton requires less water than conventional cotton due to the fact that it does not have the intense load of chemicals applied throughout the growing and manufacturing phase. The water is able to be recycled. Yarn Dyeing -Azo free, low impact dyes or natural dyes are used to dye the yarn or fabric. All dyes are certified for use GOTS Global Organic Textile Standards. Printing - Conventional cotton uses inks which are solvent based containing heavy metals, benzene, and organochlorides. Printing - Mineral inks or low impact dues are used which are certified by an independent third party such as GOTS Global Organic Textile Standards. Finishing - Many different finishes and therefore chemicals are applied to conventional fabrics to make them either stain resistant, fire resistant, wrinkle free, deodorizing, soft hand. A range of chemicals may be used including Formaldehyde a fire retardant, sulfuric acid, bromines, urea resins for stain resistance, sulfonamides, halogens, and bromines. Finishing- organic cotton fabric is left natural. There are no processes or finishes used on the organic cotton. Price cheaper than organic, it’s true! But the environmental and social impacts are huge. 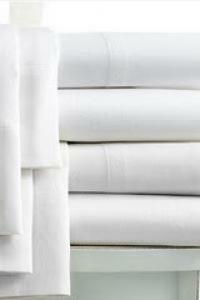 Shop for organic cotton sheets!
" If you can't sleep, then get up and do something instead of lying there worrying. It's the worry that gets you not the lack of sleep."